Westerly Ambulance Corps has been playing a vital role in the communities of Southwest Rhode Island and Southeastern Connecticut since 1917, lending manpower and expertise far and wide, in crises as diverse as the Halifax explosion and the great influenza pandemic of the First World War. But for a department with such a long and storied tradition Westerly has consistently shown a forward-thinking approach, rising time and again to the challenges and opportunities presented by changing demographics, changing technology, and changing times. It should come as no surprise then that Westerly Ambulance Corps Regional Dispatch has become the latest in a long line of Northeast agencies to adopt Symposium’s Horizon EME as its dispatch, response and management solution. While providing dispatch services has been a part of Westerly’s mission since the Corps’ earliest beginnings, the operation has grown substantially over time. In 1990, the Corps established a regional dispatch center, taking on additional departments in various communities to improve emergency communications and coordination. It now dispatches 9 fire departments and 3 ambulance services across Rhode Island and Connecticut, with a compliment of 13 full and part-time dispatchers. The new system will provide the regional dispatch center with the most modern and capable call taking, dispatching and incident management in the region, while simultaneously extending the capabilities of the department’s existing technologies (GIS, fire alarm systems, digital radio consoles, and FIREHOUSE® RMS, to name just a few). What this means is that dispatchers will for the first time have one point of instant access to all relevant information about an incident, ranging from 911 caller info or automatic alarm-based notification through to map-based incident geo-location, and important premise-based info stored in the FIREHOUSE® database. Dispatchers will be presented with customized response recommendations based on each department’s individualized rules and call types, and will have the ability to notify responders and share information in real time as the incident progresses and the situation develops. The result will be faster, safer and more effective incident notification, response, and management for the responders and citizens of every community served by the Westerly regional dispatch. 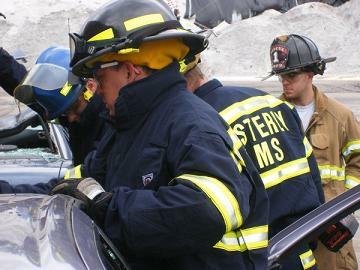 These capabilities – map-based incident location, integrated technology, customizable response, and ease of administration – were at the core of Westerly’s requirements. And it was Symposium’s proven capabilities in just these areas that brought us under consideration by the Corps. Like many departments Westerly had never utilized a fully automated call taking and dispatching solution before. This was yet another area where Symposium’s experience and track record represented a definite plus, thanks to our background in helping agencies in similar situations achieve the very best results.